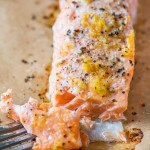 Lemon Pepper Salmon is a well-known salmon seasoning recipe. You can use lemon zest and cracked pepper instead of lemon pepper seasoning for a fresh and delicious baked salmon! Place the salmon on a baking sheet and zest the lemon over top. Slice the lemon and squeeze one half of the juice onto the salmon. Sprinkle the salmon with pepper and garlic and then bake for 15 minutes or until the salmon internally reaches 145 degrees F in the thickest part.